But there are still knights today, and they are quite real. The Knights of Chivalry represent a new breed of knights that preserve the best traditions of knighthood in today's world, keeping with the spirit of allegiance, faith, and honor. "Our purpose shall be to foster and display an attitude of 'chivalry' towards all women, and respect for all men." Our unique and distinct manifest shall be to live to become 'the total good man', one with knowledge, wisdom and enlightment We shall refrain from vulgar and profane thoughts and actions, thus becoming 'beacons of light' for those who observe, always 'knowing', "it is always better to give than to receive." 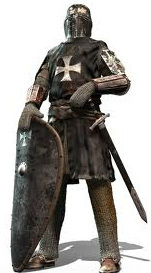 Knights strive to provide Honor and Glory to God, Country and to the Kingdom. Laboring as keepers of the faith, and serving as example of what a true servant of God should be. Thou must keep thy word to all and be good believeth and faith. Thou must know good from evil and the vain glory of the world, because great pride and bobauce maketh great sorrow. Therefore be a good knight and so I pray to God so ye may be, and if ye be of prowess and of worthiness then ye shall be a Knight of the Table.